Cockburn Sound is a large water body off the coast of Perth. 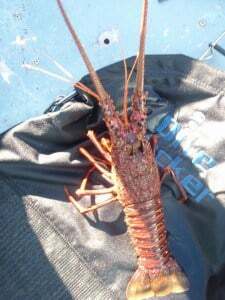 It is popular for fishing, snorkeling, crabbing, boating, water skiing, and using jet skis. It is pronounced ‘Co-burn Sound). The sound starts just south of Fremantle, and heads west to Stragglers Rocks. It then goes south east to the front of Carnac Island, and follows the front of Garden Island south all of the way to Rockingham Foreshore. Cockburn Sound is renowned for the snapper, which come in to breed every year. Every year towards the end of September hundreds of boats crowd together in the sound to try their luck for Snapper. There is plenty to do within Cockburn Sound, but if you want some other places to visit then just keep heading west. 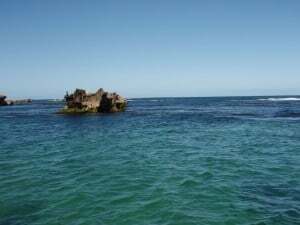 There is plenty of ocean and the back of Carnac Island, Garden Island and towards Rottnest Island all has plenty of good diving and fishing locations. The 5 Fathom Bank can easily be reached by decently set up boats, where some very impressive fish are caught. There are plenty of fish to catch in Cockburn Sound, and being relatively protected from the swell and wind it’s not difficult to get out on most days. Even when the swell and wind isn’t that great, the islands usually protect a large area in the sound. You don’t have to go out that far either, to get some decent fish. At the end of the day the primary advantage of having a boat is that you can fish where others can’t. So much of Perth is fished out off the shore, but if you go even 200 metres away from the beach then you are in a different world. I have caught good whiting and King George in Cockburn Sound, along with some great sized squid, herring and even tailor. Yellowtail, Samson fish, Mackerel, Tuna, Mulloway, Snapper and various other fish can be caught as well. There are plenty of other bigger fish if you are willing to have a bit of patience too. The best thing to do is find an area where the bottom is quite lumpy, and give it a go. Drifting seems to work very well, especially for squid and some of the larger fish. Once you find a good spot, mark it on your GPS, or remember several things that are lined up to make the right point and you can keep coming back. 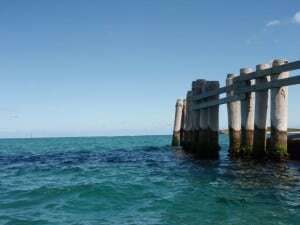 In terms of fishing from the beach, one of the better places to go is Palm Beach Jetty, even though it is very popular! There are quite a few boat ramps that people use to get into Cockburn Sound, but some are more popular. 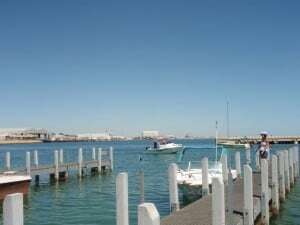 In general the Woodman Point Boat Ramp and the Rockingham ramps are most used. The Woodman Point ramp is a good quality ramp, with several launch and retrieval lanes, free parking and plenty of it. The ramp on the point at Rockingham (near Point Peron) is another favorite of mine. It’s not as big, but plenty of parking and again it is free. You can launch in Rockingham itself, but parking is limited and most of the time the skiers use the ramp. This is a great ramp if you are going to go water skiing and need to bring the boat in to have lunch on the Rockingham Foreshore. Other people launch in the Swan River and drive out, or come down from the north. At the end of the day though there is plenty of provision for launching your boat, and most don’t charge either which is a bonus. Crabbing is very popular in Cockburn Sound, but it has been closed for many years because the stocks were hit so severely. You can get Crabs by dropping pots, or diving for them. I had never tried diving for crabs until earlier on this year, and found it a lot of fun. As long as you have some thick gloves, you just dive in the shallows until you see one and then chase it. They are quite fast, but with wide sweeping arms you can get them most of the time. You can get crabs in Cockburn Sound throughout the whole area, but if you are diving picking an area that is under 5 metres deep makes it much easier! 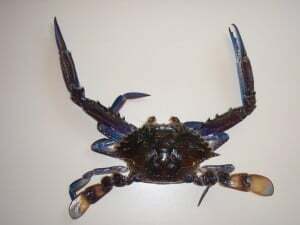 Make sure that the females don’t have any eggs, and that every crab you catch is well over sized. There are some pretty severe penalties for taking crabs that are undersized. 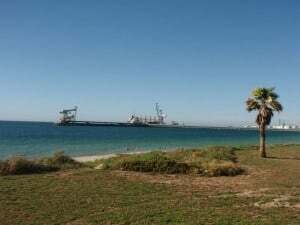 There is a ski zone just off the Rockingham Foreshore which is very popular in summer. The area is relatively sheltered, but on windy days it gets too choppy for any good skiing to take place. In saying that, there are plenty of times that I have been past and not even seen a ripple in the water! The ski area is quite large, and although there are a lot of boats around there is still plenty of room. This is one of the better skiing locations in Perth, although the Swan River has a few good spots as well. Garden Island is the most prominent island in Cockburn Sound. This has some great fishing and diving around the whole island, but if it is windy you want to hide on the eastern side. You can walk onto some parts of Garden Island, but you need to be off by dark. 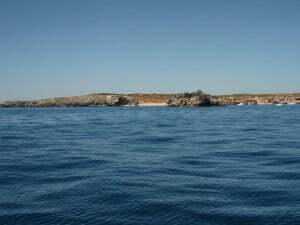 Carnac Island is a much smaller island, which is home to a huge number of sea lions. These are quite and docile, but give them their space or they can get aggressive! Rottnest Island is not in Cockburn Sound, but can be travelled to by ferry or by private boat. It’s about a 25km journey, which takes about 30 minutes in a reasonable boat. Rottnest is quite large, with accommodation and various shops. It has basically been made to support the thousands of tourists which visit it each year. 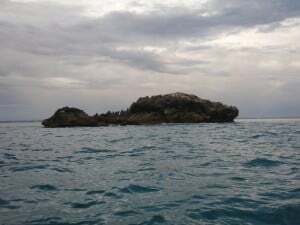 There are quite a few other land marks in Cockburn Sound, including Stragglers Rocks, Woodman Point Ammunition Jetty, the D9 wreck and more. These provide good fishing and snorkeling areas and are quite popular. On the other hand, just because something isn’t known as a land mark doesn’t mean that it’s no good! I have found some amazing locations on Cockburn Sound just by looking for lumpy ground and jumping overboard to have a look. Snorkeling and SCUBA Diving in Cockburn Sound is very popular. There are plenty of fish to see, a wide range of coral and a number of rocks, reef and wrecks that you can dive on. I have found a number of great places on the western side of Garden Island, and on the western side of Carnac Island. There are so many little places that you can find that I won’t ever run out of exploring! A large majority of Cockburn Sound allows you to spearfish, but there are a few areas that you need to be aware of. Garden Island has a strict 400m rule from the island for spear fishing, and Carnac Island has plenty of seals that you can injure, so be careful around them. I have yet to find any regulation stipulating that you can’t shoot fish there, but a few phone calls could fix that. There are plenty of fish to shoot in Cockburn Sound, but a bit of patience and thought to where you dive makes all of the difference. Cockburn Sound is a great place to do a number of activities, and with less people able to do them the fish stocks are still reasonable in some areas. If you have yet to explore Cockburn Sound then there is a lot to see, and you don’t need a huge boat to do it either. Even better; you don’t need an EPIRB for any of Cockburn Sound.